The Israeli Security Cabinet has approved what is being called ‘drastic measures’, in order to quell the Palestinian revolt against Israeli actions at Al-Aqsa Mosque, including placing additional security for public transportation in Jerusalem.The Cabinet approved the suggestion of the Israeli Prime Minister Benjamin Netanyahu which aimed to deploy hundreds of troops to assist police forces in securing Israeli cities. To begin with, Israeli military forces will deploy hundreds of non-combat troops to aid police forces in securing city centers. Six companies will join the Israeli police. Troops will be stationed in crowded areas at city centers, to increase the Israeli’s ‘sense of security’, according to Al Ray. In addition, Israeli troops will be reinforced with two additional battalions in West Bank areas, and two battalions will be deployed along the Gaza border fence. Israeli occupation police started setting up checkpoints at the entrances to Palestinians neighborhoods in occupied East Jerusalem. The cabinet also approved placing additional security for public transportation in Jerusalem. A curfew on East Jerusalem is another emergency security measure to be considered. Meanwhile, temporary checkpoints would likely be placed around the Palestinians neighborhoods of Jerusalem. Netanyahu also allowed revocation of residency rights of Palestinians deemed to have committed attacks, and a step-up in the demolition of homes of people who carry out attacks. The cabinet also approved a proposal by Public Security Minister Gilad Erdan not to return the bodies of Palestinians killed during the attacks they commit to their families. Another issue raised by Erdan and discussed at the meeting was the ease of obtaining firearms licenses for Israelis. 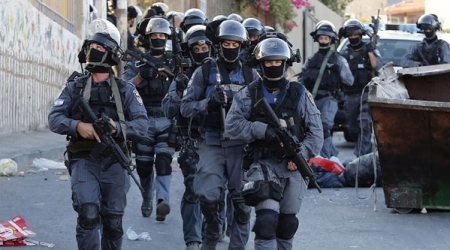 Israel has authorized police to seal off the so-called Arab sectors of occupied East al-Quds (Jerusalem), in a move set to stoke the already-heightened tensions in the occupied Palestinian territories. “The security cabinet decided several measures… notably authorizing police to seal off or impose a curfew on parts of Jerusalem in case of friction or incitement to violence,” read a statement from the Prime Minister’s office, which was released early Wednesday, according to Press TV. The occupied territories have been the scene of deadly tension between the Tel Aviv regime and Palestinians triggered by Israel’s August 26 imposition of sweeping restrictions on entries into the al-Aqsa Mosque compound in East al-Quds and Israeli settlers’ repeated attacks on the mosque. The mosque is Islam’s third holiest site after Masjid al-Haram in Mecca and Masjid al-Nabawi in Medina. The site is also highly respected by Jews and Christians, though Christians remain divided on the issue of a so-called ‘third temple’ being built on the site. On Tuesday, Netanyahu addressed an emergency cabinet session he had called to address the flare-up of violence, saying, “Today, we will decide on a series of additional aggressive steps.” “We will use, and not hesitate to use, all means at our disposal to restore calm,” he said. According to the Palestinian Health Ministry, 25 Palestinians have been killed by Israeli forces since October 3, with more than 1,300 having been injured, at the time of this report. The violence has involved Israeli settlers engaging in stabbing attacks against Palestinians, who retaliate with attacks of their own. Palestinian President Mahmoud Abbas has warned Israel of another Intifada (uprising) over Tel Aviv’s provocations in the compound. See:45 Settlers Invade Al-Aqsa Mosque, Conduct ‘Tour’ for further details.